Do you think you can defy gravity? This is your chance to prove your skills to your friends and family. Our goal is to dare you to challenge yourself and others to put their fine dexterity to the test. While competing and sharing with loved ones, you get the chance to prove you are a master at sliding pieces off a giant tower without it crashing. 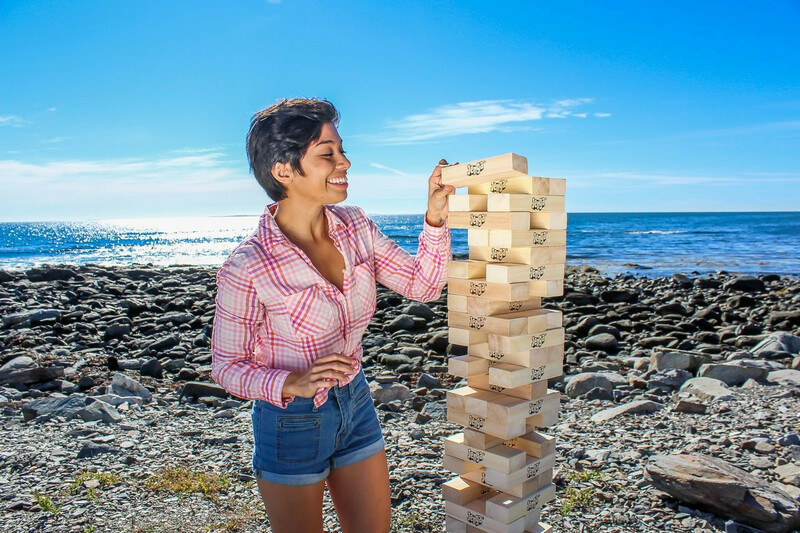 Get to know the Jenga® GIANT™ game you are using and play to its strengths. For example, even though Jenga® GIANT™ Genuine Hardwood game is made of wood bricks, the Jenga XXL® GIGANTIC Cardboard Edition Game weighs more, which can make sliding the bricks in this model more challenging. Our website has different models available for you to go into battle aware of the tools at your disposal to defeat your opponent! Jenga® GIANT™ is all about block distribution, and since we know that you want to win, the best advice is to not rush yourself! The rules don’t specify a time limit; therefore, relax, breathe, stabilize your pulse, then make your move! Taking this time helps you keep your focus and control your hand muscles to slide off pieces more easily. The beauty of playing an authentic hardwood Jenga® GIANT™ game is that blocks naturally vary from each other very slightly. Thinner blocks will be loose at first and easy to slide off, however as you move them to the top of the tower, the weight of the tower will shift. This weight alteration on the tower might make those initial stuck pieces become loose and gain you extra time to destabilize the tower and defeat your opponent! A great tactic for sliding Jenga® GIANT™ pieces is to switch hands to play to your strengths and win! Rules are rules, right? Jenga® rules state that you can only use one hand, however it doesn’t say anything about changing hands. Sliding pieces with our dominant hand is a game changer. Our dominant hand has more dexterity to slide the piece carefully and precisely. However, your position of advantage might require you to change hands from time to time. Take advantage of your natural dexterity! While your first instinct might be to pull a brick out, the motion of lifting the brick might disturb the weight of the tower and cause it to crash. To slide the piece out, it might be best to push or tap, so the tower is disturbed gradually. Keep in mind that since each brick is a different size and weight, each time a tower of bricks is assembled it will play differently! Try to focus on the easy bricks first, and push them out. The aim of the game is to make the tower as unstable as possible for your opponent. If you remove all the center blocks it forces your opponent to start eliminating blocks on the sides. This is a risky move, since the balance of the tower is compromised, but your confidence might shake that of your opponent! Let’s say your opponent was able to slide a side block off. Don’t panic! You still have a chance to win. The strategy now is to shift the side blocks to the center and then gently remove one. Here is where you get to prove yourself as master of defying gravity! The idea is to maintain the center of gravity with one block while making the other block easier to slide. Want to prove to all your friends that you can defy gravity? Discover our giant Jenga® games at jengagiant.com, pick the one you like most, and don’t forget to have lots of fun!